Yale-NUS's Halcyon Days Are Over! Today we write as concerned students troubled by a recent string of administrative decisions which point to a disturbing trend of disregard for student input in Yale-NUS College’s approach to student concerns and community issues. We stand at a crucial moment in our College’s history, where our core traditions—those of academic freedom, an entrepreneurial spirit, and a shared commitment to community-building—are being eroded. Of the developments that have been most concerning of late, four stand out as particularly troubling. First, the abrupt change in policy for College space use was made all the more shocking by its heavy-handed invocation of Singapore’s laws. An email which tried to play down the wide-reaching effects of this decision was sent only to student organization leaders on Feb. 1 about a newly set up “Event Approval Committee” to assess the “desirability and feasibility” (desirable for whom?) of holding an event on campus. Importantly, the policy disallows any event that requires licenses or permits under the Public Entertainments and Meetings Act (Cap. 257) or a permit under the Public Order Act (Cap. 257A). This is troubling given the former’s provisions regarding “transgender performances”, which raise questions about whether student events broaching these ideas risk censure. Both the policy’s drafting process and its results have troubling hints of authoritarianism. Not a word was said and no student input was sought during the drafting process of a policy which would affect virtually all students—a process which started as far back as September last year. Furthermore, Rectors and Vice Rectors—the members of the administration who are most connected with students’ experiences—are notably excluded from membership to a committee that deals with events, a central feature of campus life. More objectionable are the obstructionist clauses that require submission of applications two months in advance, and the appeals to Acts and rules that allow the purely administration-led committee (with no student representation) to “refuse any Application without assigning any reason whatsoever”, and which ban the display of publicity material without consent from the College. Students have converged on the College’s Facebook groups to condemn the new policy as going against the founding ideals and principles of the College, especially those guaranteeing the important academic freedoms that are “a cornerstone of our Institution”. The administration has responded by saying that the policy will have no impact on the school’s current practices pertaining to the exchange of ideas. These words ring hollow in the immediate aftermath of the announcement, especially the chilling effect it seems to already have had on widely-supported events. The event “1987: Untracing the Marxist Conspiracy”—despite attracting close to 130 members of the Yale-NUS community, including faculty and students, as potential attendees—has not been allowed to use the Tan Chin Tuan (TCT) Lecture Theatre, a more centralised and larger space that would have better accommodated attendees, despite suggestions by both the organisers and attending students. Instead it will be held at the much smaller Saga Rector’s Commons. While the organizer Jonas Yun ’18 has said in the event’s Facebook post that he cannot comment on why this decision was made, the TCT had not been booked for another event and the move happened immediately in the aftermath of the space use policy announcement. Indeed, a closer look at the policy suggests that events such as Rector’s Teas are considered “Business As Usual” and ought to be exempt from the policy, while large spaces such as TCT are subject to further approval. The idea that students have to use roundabout ways to hold events that add to the value of a liberal arts education is ludicrous, especially in a school that prides itself for having “no questions that cannot be asked”. Second, the revelation on Feb. 6 of the dissolution of the Graduation Committee, constitutes yet another unilateral decision made by the administration with regard to student issues. According to Dean of Students Christopher Bridges, the Committee’s dissolution was ostensibly due to the committee having fulfilled its objectives, but it seems obvious that these “objectives” were not those of graduating students but those of the administration. We also know that the Administration reacted negatively to a post by Committee member Tiffany Sin ’17, despite it being phrased politely as a call for increased participation by the student body in graduation-related discussions. Such an abrupt dissolution of the committee shows that its student members were treated as mere afterthoughts in decisionmaking. Such a unilateral action rudely dismisses the efforts of students who have contributed their time and effort for over half a year, and are still doing so despite being in arguably the most crucial semester of their College career. It suggests that the administration cares more about mining student ideas, than actually factoring student preferences into decision-making. Another example is the selection of Commencement Speaker. Despite efforts to source and create a list of speakers, students in the Committee were informed only two days before the announcement that the speaker—who was not on the list proposed by the committee—had already been decided unilaterally by Pericles Lewis, President of Yale-NUS. Ultimately, the administration has thus far treated a milestone event, which ought to be about celebrating the first-ever graduating from Yale-NUS, as though it is merely a “[public relations] obligation” to be relegated to the Public Affairs department. Third, the suspension of the Yale-NUS International Relations and Political Association (YIRPA), one of the College’s largest student organisation both in terms of membership and spending, is another troubling development that has gone little-discussed in the broader College community (except, to our knowledge, in open Student Government meetings). At present, after three weeks of suspension, no information has been given to the students regarding the reasons behind its suspension. This is disturbing for many reasons. A large number of students are involved in YIRPA, which draws its funds from the Yale-NUS Student Organisations Budget, and YIRPA itself is part of the Yale-NUS community, carries our name, and reflects upon us as an institution. As the first-ever suspension of a student organization in the College, it presents an important shift in the administration’s relationship with student organizations. The complete lack of transparency around the circumstances of the suspension is problematic and illustrative of the administration’s disregard for accountability to students. Finally, we come to the sensitive issue of mental health at Yale-NUS. Despite consistent pressure from the Student Council and extensive coverage by The Octant, progress has been slow. Efforts have been made to increase awareness, including placing posters in lifts and mounting start-of-semester events. Staffing has also been stabilized. However, it has taken us nearly half a year of investigation, confrontation and advocacy to reach this point, and there is still a long way to go. Where are the feedback channels for students to express their concerns about reaching out for mental health resources? How visible are the Wellness/Mental Health initiatives currently pushed by the school? Have there been any efforts made to engage the student body in what the vision for wellness is? The blame for this turn of events does not wholly lie on the administration. We need to reflect on how we (as students) have been complicit in bringing us to the dire straits we find ourselves in today. We have relegated too completely the task of engaging with the administration to our peers in the Student Council or our friends on various administration-linked committees. As has always been the case, issues pertaining to the student body that incite indignation blow up and then promptly fizzle out on Facebook discussions. A case in point is the Event Approval Committee document, which sparked significant outrage but has inspired little concerted effort to address concerns. 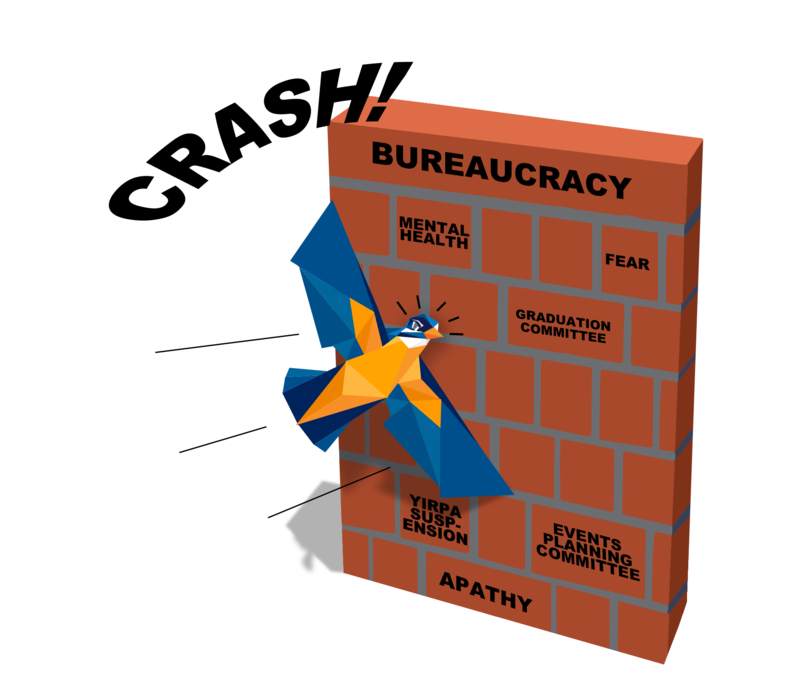 Tasked with the admittedly unenviable job of bridging the gap between students and administration, the efficacy of the Council in representing student interests has of late seemed questionable. Despite organising a Town Hall meeting, it was not until two days before the meeting that the Council thought to invite senior administration to attend. Just yesterday (Feb. 6), senior Council members tried to push the blame, claiming that administration were unlikely to attend for fear of facing student criticism. This is highly indicative of the deterioration of relationships between the Student Council and the College administration. A troubling symptom of the latter is the administration’s response to the Student Life report put forward by the Council last semester. The report, which detailed areas of student discontent and potential areas for improvement, was received in a markedly different way from previous student life surveys: this time, the administration pivoted immediately to the defensive, arguing that students should not seek to do the work of professionals and should refrain from making recommendations on specific measures that could be undertaken by the administration. Such a response marks a worrying change from an administration that just two years ago sat down patiently in a room with Student Government members who brought them a radical proposal for gender-neutral housing, itself a deeply controversial issue at the time. Even more concerning is that none of the students we approached for this article were willing to be identified as sources, preferring to remain anonymous due to fear of sanctions from the administration in one form or another. How has a climate of fear come to infect an institution so young and so full of promise? What does this all mean? A common and disturbing trend is the increasing disembodiment of the administration from students on the ground. Even with limited communication channels, student-facing members of the administration have chosen to be defensive rather than collaborative, dismissive and not accepting. Rather than being treated as “citizens of the world” and partners in a diverse endeavour to “build a community”, we are not involved in or told the reasons for decisions that ultimately impact us the most—not those making them. Entitlement is a frequently-used objection to the claim that students ought to be involved in College decision-making processes: some say we should be grateful to have any influence over administrators at all instead of lobbying for more. But institutionalization is not an excuse for freedom from accountability, especially in decisions that affect students. This school has demonstrated that it works best when students are involved in making key decisions. It has a rich history of just and principled policies crafted from meaningful consultation with students: from gender-neutral housing to Common Curriculum reform, student input has been powerfully influential when effectively mobilized to advocate for student welfare. There is nothing “entitled” about trying to get involved, actively, in the project of college-building, especially when that is part of why we are admitted in the first place. The erosion of the foundational values on which the aspirational project of Yale-NUS College was built sets a disturbing precedent that should be of utmost concern to every member of this community—staff, students, faculty, and administration. As students who participated actively in the shared project of college-building underpinned by mutual respect, it is disheartening and disappointing to see this common understanding slowly die away. Students of Yale-NUS respect and accept the risk in enrolling in a new school with uncertain prospects, with the proviso that we can help shape those prospects. Is there not then an honest obligation to honor this leap of faith, and to value the efforts of students in shaping this College? Will we so easily cede our potential—indeed, our right—to influence and enrich our college experience? Will we allow apathy and the pursuit of individual goals to make us forget the reasons we came here and the commitments we made in attending a startup college? Or will we reclaim for ourselves the capacity to influence the direction our college takes, to hold the administration accountable for its missteps, and to build the just institutions and moral communities upon which our college experience thrives? To our fellow students, we exhort you to participate as citizens of this College and fulfil your civic duties to a community of peers. First, we ask that you attend the Town Hall meeting happening tomorrow (Wednesday) 8pm at Saga Lecture Theatre 1. Even if no administrators turn up, your attendance in numbers is critical to show you care and to ensure the Council faithfully represents your concerns. Second, we are committed to coordinating a petition demanding administrative explanations on these issues should they not be addressed in tomorrow’s Town Hall, and to pave the way for more accountability to, and involvement of students in decision-making. We seek your input and support in this endeavour should it become necessary. Third, we ask that you support your fellow students as they strive in various ways to make the College a better place. An example is the newly-founded student organisation Aloe (speak to Alex Meyer ’18), which works with the administration to improve mental health initiatives at the college, and seeks to better support students in need of such resources. The Graduation Committee’s call for assistance is another example which students can enthusiastically support. Finally, we ask that you participate politically. Attend Council meetings where issues that affect our college experience are debated, get involved in Student Government elections, and keep yourself informed on goings-on through the Council’s minutes and posts. To our professors, some of the policies that are being unilaterally implemented have the potential to curtail academic freedom, and we look up to you as guardians of this ideal. We hope you will show your support and continue to be involved in the ongoing conversations of this College (as we know many of you already are). Please feel free to approach either of us if you wish to understand more about the issues in this article. To our administration, we hope you will not brush this article aside as an unwelcome intrusion into your work, or an attempt to undermine the authority of professionals. Students wish to work productively with administrators, and we ask only that you provide the conditions for doing so and engage with us honestly. We are heartened that administrators will be attending the Town Hall tomorrow. Students will be angry—and they have every right to be. But the attendance of administrators will be a respected and welcome gesture that shows the school still cares about genuine engagement with its students, and is willing to listen and incorporate their concerns and suggestions into decision-making. This will help students and administration return to a relationship of mutual cooperation, as all of us try to bring this school forward to achieve its vision of being a true community of learning, innovation, and mutual respect. Correction: Originally this article stated that members of the administration were reluctant to attend the Town Hall. It has since been corrected to reflect that they were only formally invited on Monday Feb. 6. Tee Zhuo ’18 and Feroz Khan ’18 both served on the inaugural Student Government (February 2015–2016). Tee also currently serves as Chief Justice on the 2nd Student Government Judiciary. The views articulated in this piece reflect solely those of the authors, and not the views of the Judiciary or any other body.